We were thrilled to be back for the 5th annual g4g Day @Ouro Branco events at the Federal University of São João Del Rei – Campus Alto Paraopeba in Brazil! This time we welcomed 350 girls, aged 11-16, for two mornings of hands-on science discovery - from mecatronics & neuroscience, to astrophysics, chemistry and much more! The girls had the opportunity to take part in 4 workshops and be inspired by role-model professionals. What? Our signature & most sought-after events - three mornings of hands-on & fun workshops that link all aspects of STEM to everyday life! How? We bring together up to 350 girls from different schools in Ouro Branco & Congonhas, in Minas Gerais State of Brazil - as well as dedicated sponsors and many incredible volunteers! We invite role model professionals to lead 60 minute workshops that show the link to STEM; with 20 - 25 girls in one workshop. The girls will experience 4 workshops throughout the mornings. Take a peek into our previous event! On Sept. 25 & 26, one of our g4g Board Members, Sarah Thomas, joined the incredible g4g Brazil team led by our g4g Country Manager, Kelly Torres. Held in the mountains of Ouro Branco, this is our 5th g4g Day at the University UFSJ. And what's more incredible - this event reaches 350 girls in the area! These future scientists and engineers had the chance to meet incredible role models throughout this 2-day event. The Opening Ceremony brought forward our #SuperScientists PhD Kelly Torres, PhD Regina Pinto, PhD Natália Landin and PhD Érica Gravina, before heading to the hands-on workshops. Our signature DNA extraction workshop fascinated the girls (“What? Wait… I can SEE my DNA in a test tube?!”). And they studied the MOON! Yes, the workshop about Astronomical Observation allowed the girls to observe Venus, Mars, the Moon, Saturn, Jupiter, and its 4 moons: Europa, Ganímedes, Io and Calisto! In addition to the Astronomical Observation, girls experienced physics first-hand, made paper helicopters, created a celestial chart, and made crystals, vulcano and minerals from scratch! A tremendous thank you to all our volunteers, greenlight girls and guest speakers of the day - you have all been incredible! You can take a look at the photo album here! On November 8, 9, 10th, 2017 we were excited to be back for the 4th annual g4g Day @Ouro Branco events at the Federal University of São João Del Rei – Campus Alto Paraopeba in Brazil! We welcomed up to 350 girls, aged 11-16, for three mornings of hands-on science discovery - from mecatronics & neuroscience, to astrophysics, chemistry and much more! The girls will have the opportunity to take part in mentoring sessions and be inspired by role-model professionals. 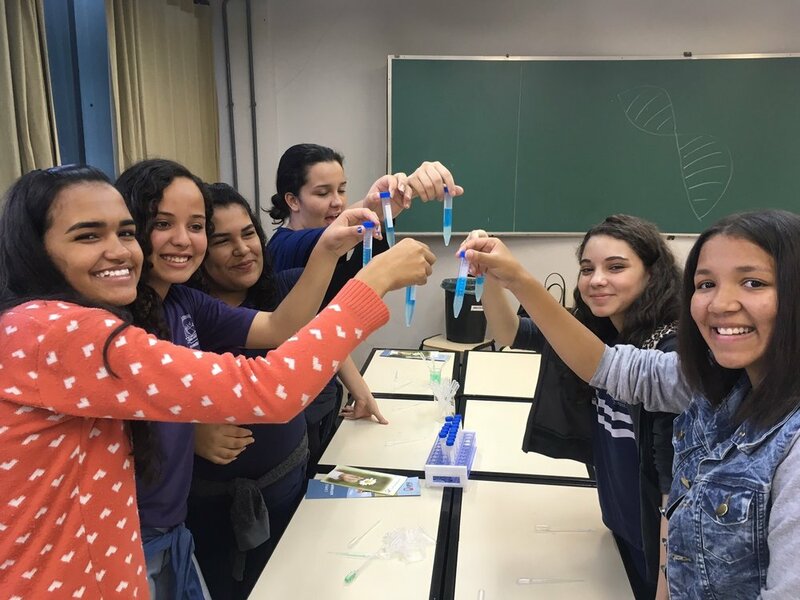 With this fourth event, we are so proud to have inspired more than 1000 girls in Science, Technology, Engineering, and Mathematics (STEM) in the Minas Gerais State of Brazil!